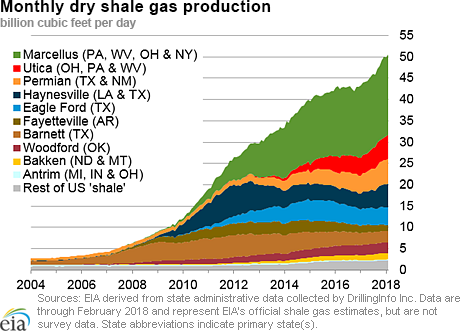 Working natural gas in storage in the Lower 48 states as of March 31, the traditional end of the heating season (November 1–March 31), totaled 1,351 billion cubic feet (Bcf) according to EIA’s Weekly Natural Gas Storage Report released on April 12. As of March 31, working gas stocks were 29% lower than the five-year (2013-17) average for the end of the heating season. 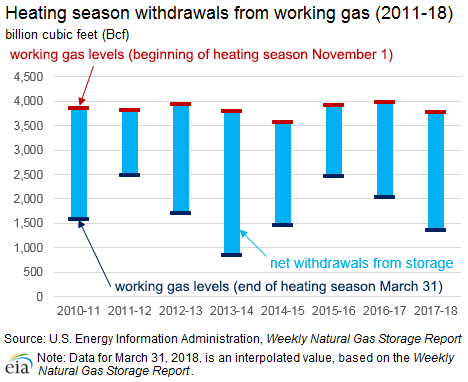 This heating season had the lowest level for working gas stocks for this time of year since 2014, when working gas stocks ended the 2013–14 heating season at 837 Bcf. The 2017–18 U.S. heating season was characterized by periods of significantly colder-than-normal temperatures that resulted in relatively substantial natural gas storage withdrawals, including a record-breaking weekly withdrawal of 359 Bcf in January 2018. Net withdrawals from storage during the 2017–18 heating season were 2,427 Bcf. This season had the second-highest net withdrawals recorded in a heating season, falling short of the 2,958 Bcf net withdrawals reported for the 2013–14 heating season, which was also characterized by significantly colder-than-normal temperatures during the winter. 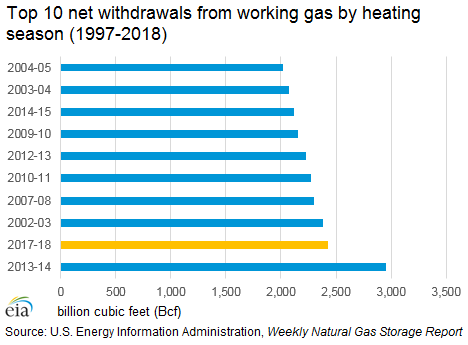 The third-largest net withdrawals from storage were reported for the 2002–03 heating season, when working gas stocks ended the heating season at the lowest level on record at 730 Bcf. Heading into the U.S. natural gas storage refill season, EIA expects that injections into storage will exceed the five-year average. Regulations require many of the larger storage operators to provide winter heating service, and storage levels typically tend to end the refill season, which runs from April 1 to October 31, close to the previous five-year average. EIA’s April Short-Term Energy Outlook (STEO) forecasts that working gas levels will total 3,767 Bcf at the close of the 2018 refill season, just short of the five-year (2013-17) average of 3,806 Bcf. To end the refill season at the forecasted level, net injections will total about 2,416 Bcf, or 11.3 Bcf/day. This level would be the second largest volume of refill season net injections on record, falling just short of the 2,518 Bcf that were injected during the 2014 refill season. In that year, working gas stocks ended the refill season at 3,564 Bcf—the lowest end-of-refill season level since 2009. The forecast also exceeds last year’s net injections of 1,753 Bcf by 38%, or 3 Bcf/day. EIA forecasts that dry gas production in the United States will average 81.6 Bcf/day during the 2018 refill season—an increase of 8.3 Bcf/ day, or 11% more than last year’s rate—to offset projected increases in consumption, exports, and refill season requirements. 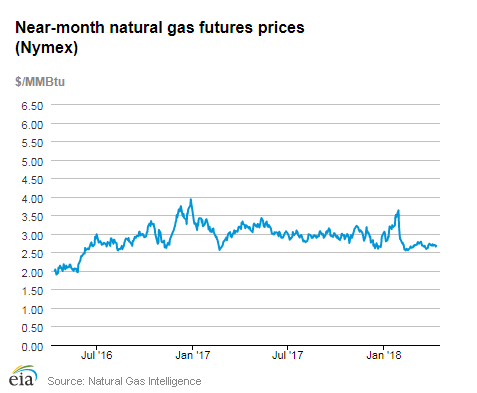 Natural gas spot prices fell at most locations this report week (Wednesday, April 4 to Wednesday, April 11). The Henry Hub spot price fell from $2.77 per million British thermal units (MMBtu) last Wednesday to $2.69/MMBtu yesterday. At the New York Mercantile Exchange (Nymex), the May 2018 contract price fell 4¢ from $2.718/MMBtu last Wednesday to $2.675/MMBtu yesterday. Net withdrawals from working gas totaled 19 billion cubic feet (Bcf) for the week ending April 6. Working natural gas stocks are 1,335 Bcf, which is 35% lower than the year-ago level and 22% lower than the five-year (2013–17) average for this week. 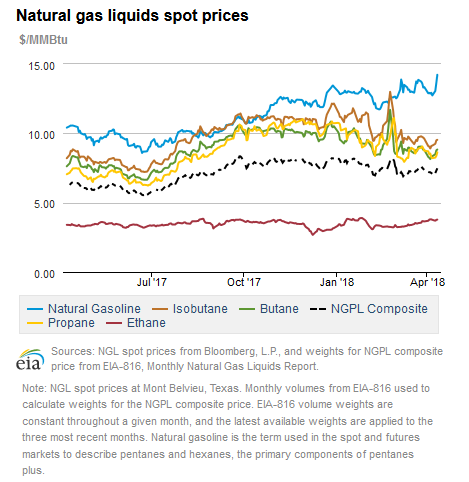 The natural gas plant liquids composite price at Mont Belvieu, Texas, fell by 1¢, averaging $7.23/MMBtu for the week ending April 11. The price of propane fell by 3%. The price of natural gasoline and butane rose by 2%, and the price of ethane and isobutane rose by 1%. According to Baker Hughes, for the week ending Tuesday, April 3, the natural gas rig count remained flat at 194. The number of oil-directed rigs rose by 11 to 808. The total rig count increased by 10, and it now stands at 1,003. This report week is the first time the total rig count has exceeded 1,000 since April 2015. Prices fall across most of the Lower 48 states. This report week (Wednesday, April 4 to Wednesday, April 11), the Henry Hub spot price fell 8¢ from $2.77/MMBtu last Wednesday to $2.69/MMBtu yesterday. Warmer temperatures in the Northeast and Midwest toward the end of the report week affected regional prices. At the Chicago Citygate, prices decreased 39¢ from $2.94/MMBtu last Wednesday to $2.55/MMBtu yesterday. At the Algonquin Citygate, which serves Boston-area consumers, prices dropped $2.58 from $6.81/MMBtu last Wednesday to $4.23/MMBtu yesterday, with a high of $9.61/MMBtu last Thursday. At the Transcontinental Pipeline Zone 6 trading point for New York City, prices decreased 13¢ from $2.92/MMBtu last Wednesday to $2.79/MMBtu yesterday, with a high of $3.21/MMBtu on Monday. Tennessee Zone 4 Marcellus spot prices decreased 72¢ from $2.43/MMBtu last Wednesday to $1.71/MMBtu yesterday. Prices at Dominion South in northwest Pennsylvania fell 56¢ from $2.57/MMBtu last Wednesday to $2.01/MMBtu yesterday. Warm temperatures in California support higher natural gas prices. Prices at PG&E Citygate in Northern California rose 8¢, up from $2.66/MMBtu last Wednesday to $2.74/MMBtu yesterday. The price at SoCal Citygate increased 38¢ from $2.97/MMBtu last Wednesday to $3.35/MMBtu yesterday, with a high of $3.83/MMBtu on Tuesday. Los Angeles had daily high temperatures of 95 degrees Fahrenheit (°F) on Monday and 85°F on Tuesday, supporting demand increases because of cooling needs. Parts of the Southeast also experienced higher temperatures, leading to increased cooling demand. Nymex prices fall. At the Nymex, the price of the May 2018 contract decreased 4¢, from $2.718/MMBtu last Wednesday to $2.675/MMBtu yesterday. The price of the 12-month strip averaging May 2018 through April 2019 futures contracts declined 5¢ to $2.829/MMBtu. Supply remains flat. 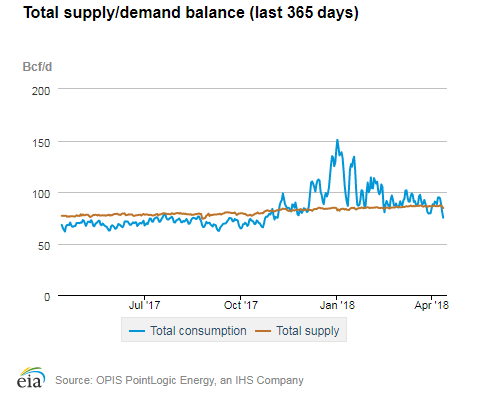 According to data from PointLogic Energy, the average total supply of natural gas remained the same as in the previous report week, averaging 86.4 Bcf/d. Dry natural gas production remained constant week over week. Average net imports from Canada increased by 1% from last week. Natural gas consumption rises because of both heating and cooling demand. Total U.S. consumption of natural gas rose by 7% compared with the previous report week, according to data from PointLogic Energy. Natural gas consumed for power generation climbed by 4% week over week, as some Pacific and southern regions experienced an increase in cooling degree days (CDD). In the residential and commercial sectors, consumption increased by 14% as a result of northern regions that experienced an increase in heating degree days (HDD). Industrial sector consumption increased by 2% week over week. Natural gas exports to Mexico increased 16% with the conclusion of maintenance on Mexico’s Los Ramones pipeline, according to Genscape data. U.S. liquefied natural gas (LNG) exports decrease week over week. Five vessels (combined LNG-carrying capacity 17.7 Bcf) departed the Sabine Pass liquefaction facility from April 5 to April 11. One vessel (LNG-carrying capacity 3.5 Bcf) was loading at the terminal on Wednesday. Dominion Energy Cove Point liquefaction terminal entered commercial service, according to the press release issued by Dominion Energy on April 10. Following maintenance, the facility has been ramping up to full production. The tanker Gemmata was loading a second cargo at Cove Point on Wednesday, and two more tankers are en route to the terminal, with anticipated loadings in April. Working gas storage continues to post net withdrawals during first week of the refill season. Net withdrawals from storage totaled 19 Bcf for the week ending April 6, compared with the five-year (2013–17) average net injection of 9 Bcf and last year's net injections of 9 Bcf during the same week. The natural gas storage refill season begins on April 1, and this week’s report marks the fourth time since 2010 that net withdrawals from storage on a national level were reported during the month. Working gas stocks totaled 1,335 Bcf, which is 375 Bcf lower than the five-year average and 725 Bcf lower than last year at this time. Withdrawals from storage are driven by colder-than-normal temperatures in the Midwest and East regions. Working gas stocks posted larger-than-normal net withdrawals during the storage week. Net withdrawals totaled 20 Bcf and 12 Bcf in the Midwest and East regions, respectively, compared with the five-year average withdrawal of 4 Bcf in both of these regions. This week’s net change included withdrawals from base gas. Withdrawals from base gas were reported to EIA for the storage week. As a result, a small portion of this week’s reported net change included flows from base gas. 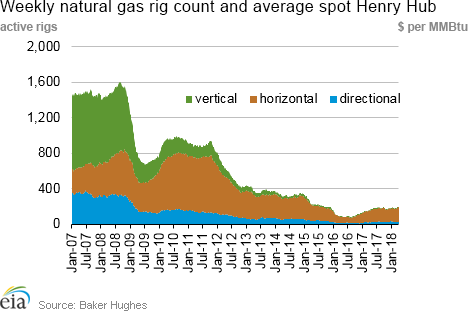 Although working gas levels remain adequate in the aggregate on a regional basis, some natural gas storage operators’ working gas levels have fallen quite low. When working gas levels fall to zero, natural gas storage facilities may have the operational flexibility to draw down some supplies of base gas. However, the tradeoff associated with these withdrawals from base gas is diminished deliverability, because the pressure in the facility will be reduced. These withdrawals from base gas are expected to be temporary, and these storage operators likely will replenish their base gas at some point in the next several weeks. EIA will provide notification in future weekly reports if storage operators make additional withdrawals from base gas. The average May 2018 futures contract price trades at a discount to the average weekly spot price. 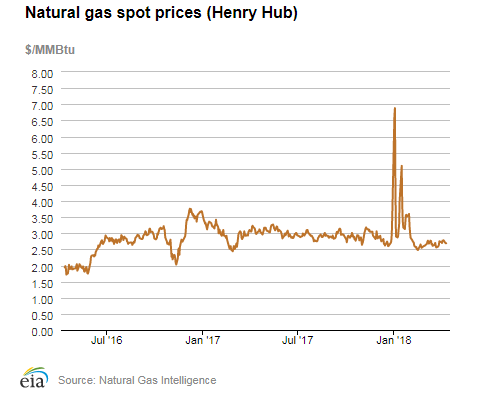 During the most recent storage week, the average natural gas spot price at the Henry Hub was $2.74/MMBtu, 5¢/MMBtu higher than the front-month futures price at the Nymex. This pricing pattern provided economic incentives to withdraw natural gas from storage to avoid exposure to the spot market. A year ago, the spot price was 11¢ lower than the front-month contract. Reported net change of 19 Bcf out of storage is lower than most analysts’ expectations. According to the Desk survey of natural gas analysts, estimates of the weekly net withdrawal from working natural gas storage ranged from 8 Bcf to 27 Bcf, with a median of 13 Bcf. Prices for the futures contract for May delivery at the Henry Hub rose 2¢/MMBtu to $2.69/MMBtu in 867 trades following the release of the Weekly Natural Gas Storage Report. Prices traded close to that level in subsequent trading, averaging $2.68/MMBtu. Temperatures are colder than normal across the Lower 48 states during the storage week. Temperatures in the Lower 48 states averaged 47°F, 2°F lower than the normal and 6°F lower than last year at this time. Temperatures in the heavy natural gas-consuming areas of the Midwest and Middle Atlantic posted significantly colder-than-normal temperatures. The average temperature for the Lower 48 states was somewhat higher than during the prior storage week.